For quality full-color postcards, Bargain Printing offers a complete solution supported by our in-house mailing services. Whether you are looking for single or double sided postcards, with full color for more impact, Bargain Printing has you covered. Bargain Printing prints on a heavy 16 pt card stock that complies with USPS mailing requirements. Remember, the heavier the stock, the better the card, because it stands out from the crowd. Everyone likes to get mail. Whether you are selling apartments, advertising a change of location or a new website, advertising a concert, or just letting your neighbors know that they are important to you, printing post cards can tell your story. And because they are small enough to keep in that paperback you read on the train, your story gets a very long shelf life. You want something that stands out from the crowd. Color printing on heavy card stock will always get your attention. 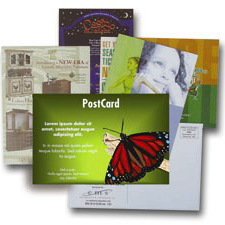 Add some photography, some colorful graphics and your message will stand out in the mail room. Use them to highlight what you do best or what you do that’s new and keep your customers up to date so they know your business and how to get in touch with you. Post cards are a great thank you too. You can send out cards every time you get a new order out to stay in touch with folks you haven’t heard from in a while, just to remind them that you are there and that their business is important. If you have a newsletter, you can send post cards to thank your customers for their subscription or to let them know what’s coming up in the next issue. 3" x 4" 3" x 5" 4" x 4" 4" x 5" 4" x 6" 4" x 9" 4.25" x 5.5" 4.25" x 6" 4.25" x 11" 4.75" x 4.75" 5" x 5" 5" x 7" 6" x 6" 6" x 8" 6" x 9" 6" x 11" 8.5" x 3.5" 8.5" x 3.667" 8.5" x 5.5" 8.5" x 6" 8.5" x 7"
This selected size is not available with the current paper stock. Please select another stock or size.